Min Bahadur Bhandari was sitting at home one evening in September 2001 when the Maoists accused him of being a spy and took him away to a nearby forest, chopped off his leg and smashed his hands. He spent Rs 500,000 of his own money to be treated, and is now wheel-chair bound. Rambabu Ghimire was forced to lodge and feed a group of Maoist guerrillas one night in 2002. The Army found out, took him in for questioning, and he was severely tortured. Ghimire was so traumatised he still cannot work. Jit Bahadur Bhujel was also accused of supporting the Maoists and was tortured so heavily by the Police that they broke his hand and it never healed properly. He has been physically handicapped, and can’t find work. Bishnu Ghimire was a student with the Maoist-affiliated college union in Lamjung, he was detained by the security forces in 2004 and tortured physically and mentally for 15 days. Ishwar Ghimire was detained by the Army at the Bhorletar Base and tortured. He fled to India, but couldn’t work because of injuries. Memories of that period haunted him so much he sold off his homestead and livestock to live in Pokhara. He still cannot find proper work because of his wartime trauma. The conflict ended ten years ago in April 2006, and many families of the dead or disappeared have received compensation. But those who were severely tortured by both sides, and whose physical and mental scars have never healed, never got apologies or reparations from the state. In village after village here in Lamjung district, there are those who suffered torture under detention — they were students, farmers, traders, and most were non-combatants caught in the middle of a conflict they wanted no part in. The Maoists would force them to house and feed them for the night, and state security forces would find out and take the family into custody. A Maoist would be killed, and the guerrillas would abduct, torture or kill farmers they suspected of being spies. Billions have been spent in the peace process, and families of those who lost their lives are eligible to receive up to Rs 1 million compensation. Many relatives of the disappeared have received Rs 500,000. But the victims of torture, many wounded and handicapped for life, have got nothing. “The two former enemies are now in government and they have forgotten us, the people who had to suffer inhuman torment,” said Mayanath Adhikari, who heads a society of torture victims in Srimanjyang village. In fact the plight of the tortured is similar to relatives of the dead and disappeared who are not affiliated to any political party, or those who don’t have the connections to work the system to collect their compensation. Those who wanted no part in the war and suffered the most are the ones who continue to suffer. Of the 23 people still listed as missing in Lamjung, 15 were disappeared by the army and police, one by the Maoists and in the case of seven it is not clear who was responsible. Some 150 people were killed in Lamjung during the conflict, and 110 were officially listed as injured. 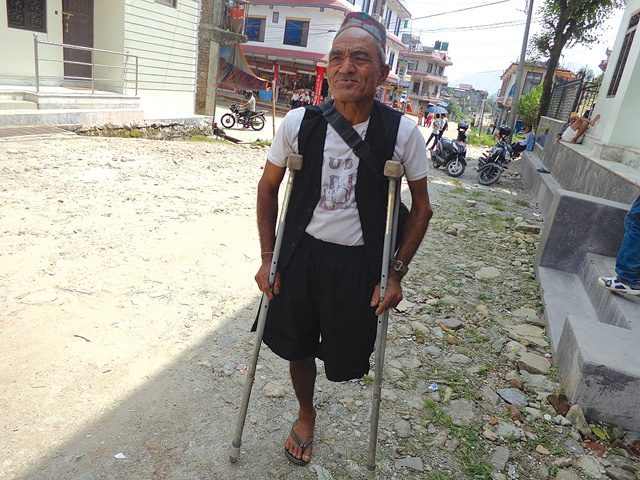 “We sent the list of wounded and handicapped to the Peace Ministry, but it wasn’t accepted,” said Mohanhari Poudel of the district Peace Committee, who claims the number of wounded is much higher. Just as the former enemies are now partners in government, ten years after the end of the war, relatives of the victims of the conflict have also got together to pursue truth, justice and reconciliation. 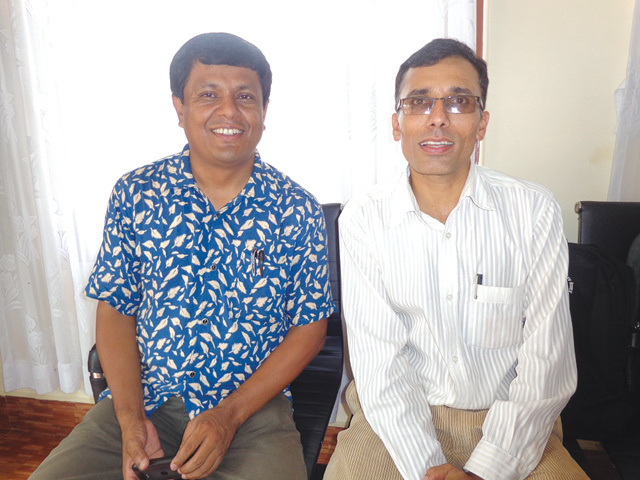 One of them is the Conflict Victims’ Common Platform (CVCP) which was set up by Ram Bhandari and Suman Adhikari (pic). Bhandari’s father, Tej Bahadur, was detained by the Army in January 2002 and never seen again. Adhikari’s father, who was a teacher and member of the local chapter of Amnesty International, was taken away by the Maoists while in class in 2001, tied to a tree nearby and shot dead. Families of victims from both sides accuse the state of pretending as if the setting up of the Truth and Reconciliation Commission on Forced Disappearances means the end of the peace process, and say sustainable peace is only possible with justice and truth. Victim families are also skeptical that the two commissions are serious about addressing their demands.